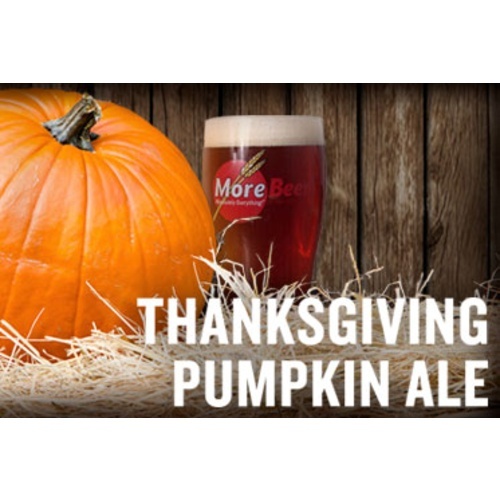 (Makes 5 gallons) Our famous Thanksgiving Ale is based on an Amber Ale with modest bittering, a mild hop finish, and of course the subtle flavor of pumpkin spice. Not overpowering in the spice, it is a great beer to share with both experienced and novice beer lovers. 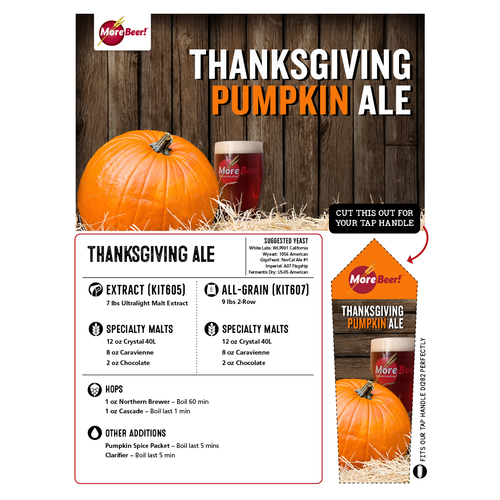 Show up at Thanksgiving with a case of your own pumpkin spiced beer and your in-laws may just change their mind about you... normally you can't buy that kind of love. 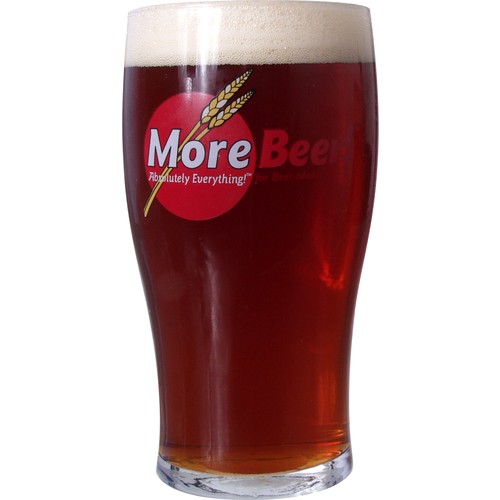 Morebeer grain kits have always produced excellent brews! So, let me start by saying that I've been AG brewing for a while. I ordered 4 kits from MB because they were on sale. This was the first of the kits that I brewed. Everything appeared normal, but I noticed that the grain was not milled to the level that other HBS shops do. I typically average around 76% brewhouse efficiency. With this kit, I hit 62%. Then I brewed the Sunset Pale Ale and hit 60% efficiency. Thanks Morebeer for making me question my process. I then went back to my basics and ensured that I was following my process precisely. I brewed the Hefeweizen and hit 59%. At first, I thought that maybe Morebeer had let this grain sit around for a long time, but a quick internet search reveals that this has been going on for a long time. Morebeer is more worried about stuck sparges than they are about having customers actually be able to brew their kits effectively. Frustrated, I went to my LHBS shop and picked up some grain for a big beer. I hit 72% on a 1.084 OG beer. So, I guess that I will need to run up to the LHBS and see if they will run this last kit through their mill so that I can at least come close to expected recipe. Needless to say, I will not order another kit from Morebeer until I own my own mill. Lesson learned. Hi Joseph - You have valid points and your words have no fallen on deaf ears. This is something we will definitely look into. Please give us a call at 1-800-600-0033 or email us at info@moreflavor.com so that we can assist you. We are here to help. Cheers! It is a good kit. I ad a 28 oz can of Libby's pumpkin purée to the mash and stir well. I only use one teaspoon which is half of the pumpkin spice mix that comes with kit. You end up with a subtle pumpkin beer . Which is my personal preference. Everyone loves it so give it a try. Awesome brew. By far the best pumpkin beer my friends or myself have tasted. In addition to the instructions, I added 1 can of pumpkin puree to the mash and kept it at about 152. then during the boil I added 2lbs of brown sugar and a little bit more cinnamon, nutmeg, and allspice for kicks. the rest followed the instructions. during the secondary I added another can of pumpkin puree and let it sort out for about 1-2 weeks. I then bottled it. As you would expect, initially the beer was sweet, but given time to mature in the bottle, mmmmm it is awesome. delicious. despite brewing it at only two months ago, I'm nearly out! I brewed this several weeks ago. Primary for two weeks, bottled. Waited about a week before bottling to sample and there was a strong yeast flavor. Waited another three weeks and this stuff is so excellent. I really love it. Proudly bringing to Thanksgiving for the family to share next week. Brew it, but let it properly age before serving!